Combine a flight over the majestic Himalayas with the cultural sights of Kathmandu in Nepal & a tiger safari in Chitwan National Park. Then fly to neighbouring India to explore the cultural sights of the Golden Triangle - Delhi, Agra & Jaipur - including the remarkable Taj Mahal & Amber Fort. Private driver, English speaking city guides, all light aircraft flights, elephant safari & specified sightseeing included. You will be met at Kathmandu Airport and transferred to your hotel in this spectacular Himalayan country that is famous for trekking and is home to the highest mountain in the world - the mighty Mount Everest. Check into your hotel amidst the intoxicating sights and sounds of this capital city that was devastated by an earthquake in 2015, but is now slowly recovering. Today you will be introduced to the highlights of Kathmandu, as you explore its ancient UNESCO World Heritage sites with your guide. We start with a visit to the sacred Buddhist pilgrimage site of Swayambhunath (meaning 'sublime trees'), the oldest Buddhist stupa in the Kathmandu Valley, that is said to be over 2,000 years. The main structure is a solid hemisphere of brick and earth, supporting a lofty copper-gilted conical spire. Painted on the four-sided base of the spire are the all-seeing eyes of Lord Buddha. The hill is a mosaic of small shrines and pagoda temples and, as many monkeys live here, it is also known as Monkey Temple. From here you will have a perfect vantage point over the Kathmandu Valley. We continue to the Hindu pilgrimage town of Pashupatinath, situated 3 miles (5 km) northeast of the Kathmandu Valley. Here you can view one of the holiest Hindu temples, dedicated to Lord Shiva. It is built in a pagoda style, with a gilded roof and richly carved silver doors. Behind the temple are the cremation grounds, and here you will see many Sadhus (holy men) with their matted hair and ash rubbed on their bodies. Visitors can view the temple from the eastern bank of the sacred Bagmati River, as non-Hindus are not allowed to enter the temple. Our next stop is the stupa at Boudhanath, the largest Buddhist temple in the world. Built by King Man Deva on the advice of the goddess Mani Jogini, its octagonal base is inset with prayer wheels. The shrine is ringed by houses of Lamas (priests), with four pairs of eyes looking in the four cardinal directions - keeping watch for righteous behaviour and human prosperity. Here you can see Tibetan monks involved in their chanting rituals and daily life. After lunch (own account) we explore the capital city of Kathmandu - known locally as Kantipur. Here we visit Durbar Square, with its array of temples overlooked by the Hanuman Dhoka Palace - the ancient place of Nepalese royalty. Although many of these structures collapsed during the devastating earthquake of 2015, not all areas were affected and the soul of the city is to be found in its backstreets, where you can soak up the local cultural and artistic heritage. Most of the people are Hindu but there are also many Buddhist, as the the Buddha was born in Lumbini, when this country was under the control of India. Rise early this morning to transfer to the domestic airport for a thrilling flight over the majestic Himalaya Mountains. The flights last 1-hour and will take you close to Mount Everest, flying at 25,000 ft (7,600 m). Departures begin at dawn as the earlier flights usually provide the best views, with the snow peaks change colour as the sun rises and the cloud cover is still low. As the day warms ups the cloud cover rises. The Himalayas are the youngest and highest mountain range in the world, extending for over 1,500 miles (2,400 km) across the top of the Indian sub-continent. The central section that runs through Nepal has 1,310 peaks over 20,000 ft (6,000 m). Eight of these peaks are over 26,000 ft (8,000 m) - Sagarmatha (popularly known as Mount Everest), Kangchanjunga, Lhotse, Makalu, ChoOyu, Manaslu, Dhaulagiri and Annapurna. The remainder of your day is free to explore Kathmandu with your guide. Although Durbar Square was destroyed by the earthquake, many areas were not affected and the soul of the city is to be found in its backstreets, where you can soak up the local cultural and artistic heritage. Most of the local people are Hindu but there are also many Buddhist, as the Buddha was born in this country when it was under the control of India. Transfer to Kathmandu Airport for your light aircraft flight to Bharatpur, where you will be met and transferred 1-hour to your jungle lodge situated outside Chitwan National Park. Chitwan National Park (meaning 'Heart of the Forest') is one of the few remaining undisturbed sections of the Terai Plains that extend along the southern foothills of the Himalayas - all the way through India, Nepal, Bhutan and Bangladesh. Together with adjacent Parsa Wildlife Reserve in the east, and India's Valmiki National Park to the south, this huge protected area of grassland, marshland and subtropical forest covers an area of over 1,370 square miles (3,549 sq km) and ranges in altitude from 330 ft (100 m) in the river valleys to over 2,600 ft (800 m) in the Churia Hills. Check into your lodge in this region that is rich in flora and fauna. Rise early today for an exciting Elephant Back Safari into Chitwan National Park. Chitwan (meaning ‘Heart of the Jungle’) was the first national park established in Nepal and its river plains and jungle provide sanctuary for one of the largest populations of the rare Bengal tiger, along with one-horned rhinos, fish-eating Gharial crocodiles, wild elephants, leopards and sloth bears. However the dense jungle, tall grass and nocturnal hours kept by many animals make spotting wildlife difficult. 68 species of mammals have been recorded in this park including deer, wild boar, bison and monkeys. 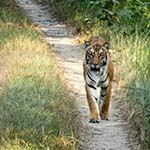 Early morning is the best time to track tigers and other wildlife, but be aware that it is extremely difficult to find tigers in this national park and sightings are rare. During the warm summer months, before lunch we visit the elephant stables to watch the elephants bathing in the river. Weather permitting and subject to water levels, in the afternoon we embark on a Boat Safari to view aquatic birds, crocodiles and other wildlife from the river. In the evening enjoy a slide presentation on Chitwan National Park and its wildlife. Note: Jeep safaris are prohibited during the monsoon season (June to September). Wear warm clothes, including woolly hats and gloves, to protect you from the wind chill in the early morning. This morning we set out early on a Jeep Safari to identify birds and searching for wildlife in the grasslands, riverine forests, dense sal forests and oxbow lakes of Chitwan National Park. We also visit a local village to learn more about their lifestyle. In the afternoon we drive to Kasara, the headquarter of Chitwan National Park, to visit their gharial (fish-eating crocodile) hatchery project. We then drive through dense sal forest to the oxbow lakes (Lami Tal & Tamar Tal) where, weather permitting, we silently glide down the Rapti River in a traditional dug-out canoe and view aquatic birds, crocodiles and any animals that may come down to the riverbank to drink. In the evening farmers from a nearby villages will entertain you with a show of their skills in traditional Tharu stick dancing. Note: Jeep safaris are not permitted during monsoon season (June to September). This morning transfer 1-hour to Bharatpur Airport for your light aircraft flight to Kathmandu. You will be met at Kathmandu Airport and transferred to your hotel in this capital city. Transfer to Kathmandu Airport for your flight to Delhi. You will be met at Delhi Airport and transferred to your hotel in this bustling city. Transfer to Jaipur Airport for your flight to the bustling city of Delhi. You will be met at Delhi Airport and transferred to your hotel situated near the airport.